Execution: A History of Capital Punishment in Britain. Simon Webb. The History Press. Stroud, Gloucestershire. 2012. 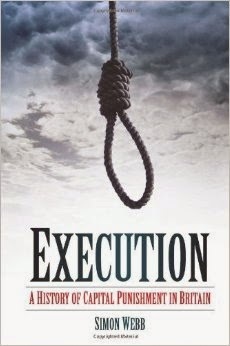 The author of this book takes a look at the various methods of execution used throughout Britain's history. In the course of a chapter entitled Shot at Dawn, Webb tells the story of German spy Josef Jakobs. Given the multitude of small errors that have crept into Josef's story over time, I am constantly on the lookout for the propagation of those errors. In the very first paragraph, the author claims that Josef was the last person executed by a British firing squad on British soil. I always knew that Josef was the last person executed at the Tower of London, but this statement was a new one. A bit of research revealed that the author is correct. There were two executions by firing squad at Shepton Mallet Prison in 1944 - both were conducted by American troops against American soldiers who had killed fellow soldiers. In 1946, Theodore William Schurch, a British-Swiss soldier was charged with offences under the Treachery Act. He was found guilty by court martial and hanged at Pentonville Prison. Why Schurch was hanged and not shot is a mystery at this point. Back to the book. The author says that Josef was a Sergeant in the German Army which is a stretch. He was perhaps a Corporal. Most of the information about Josef's capture is correct. The author notes that "there is a mysterious gap of five months between Jakobs' capture and his interview by the police at Scotland Yard". Clearly the author has not delved into the depths of Josef's declassified MI5 files. On the other hand, the author does quote Josef's petition to the King, but this information is available on Stephen Stratford's website. The account of Josef's execution has a few of the usual errors - Josef was seated in a chair because he was unable to stand (not true). Interestingly, the book claims that the execution took place "at the end of the alleyway which held the rifle range", not the rifle range itself. The book also touches on Karel Richter's arrival and execution. There are a few errors - Richter did not arrive on 31 May but on 12 May. His career in espionage lasted several days, not 30 minutes. Most of the section on Richter deals with his execution, during which he fought wildly for his life. It would appear the author has relied on second-hand sources for the information on Josef and Richter. As a result, there are several errors in both accounts. 3 out of 5 - The author writes well and made the stories interesting. I did learn something new - Josef was the last person executed by British firing squad on British soil.